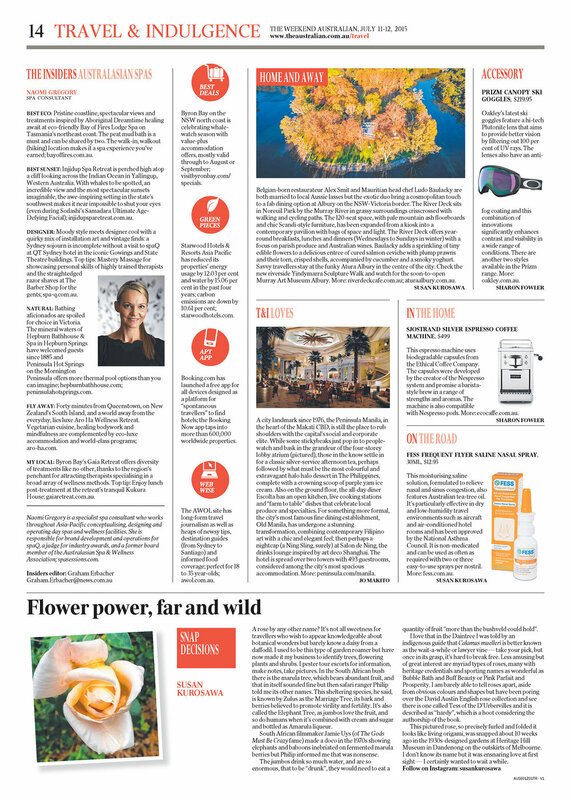 THE AUSTRALIAN asked for some of my favourite spa's for the Travel and Indulgence section, published this weekend. Here's what I came up with. BEST ECO: Pristine coastline, spectacular views and treatments inspired by Aboriginal Dreamtime healing await at eco-friendly Bay of Fires Lodge Spa on Tasmania’s northeast coast. The peat mud bath is a must and can be shared by two. The walk-in, walkout (hiking) location makes it a spa experience you’ve earned; bayoffires.com.au. BEST SUNSET: Injidup Spa Retreat is perched high atop a cliff looking across the Indian Ocean in Yallingup, Western Australia. With whales to be spotted, an incredible view and the most spectacular sunsets imaginable, the awe-inspiring setting in the state’s southwest makes it near impossible to shut your eyes (even during Sodashi’s Samadara Ultimate Age- Defying Facial); injidupsparetreat.com.au. DESIGNER: Moody style meets designer cool with a quirky mix of installation art and vintage finds: a Sydney sojourn is incomplete without a visit to spaQ at QT Sydney hotel in the iconic Gowings and State Theatre buildings. Top tips: Mastery Massage for showcasing personal skills of highly trained therapists and the straightedged razor shaves at The Barber Shop for the gents; spa-q.com.au. NATURAL: Spa aficionados are spoiled for choice in Victoria. The mineral waters of Hepburn Bathhouse & Spa in Hepburn Springs have welcomed guests since 1885 and Peninsula Hot Springs on the Mornington Peninsula offers more thermal pool options than you can imagine; hepburnbathhouse.com; peninsulahotsprings.com. FLY AWAY: Forty minutes from Queenstown, on New Zealand’s South Island, and a world away from the everyday, lies luxe Aro Ha Wellness Retreat. Vegetarian cuisine, healing bodywork and mindfulness are complemented by eco-luxe accommodation and world-class programs; aro-ha.com. MY LOCAL: Byron Bay’s Gaia Retreat offers diversity of treatments like no other, thanks to the region’s penchant for attracting therapists specialising in a broad array of wellness methods. Top tip: Enjoy lunch post-treatment at the retreat’s tranquil Kukura House; gaiaretreat.com.au. Naomi Gregory is a specialist spa consultant who works throughout Asia-Pacific conceptualising, designing and operating day spas and wellness facilities. She is responsible for brand development and operations for spaQ, a judge for industry awards, and a former board member of the Australasian Spa & Wellness Association; spasessions.com.